To Hull and back – this urban-centric writer was daring to venture out of Fowler Towers to head North, but sadly I can’t be in Hull due to an unavoidable and unforeseen schedule clash which will find me heading overseas next week. However, I’ll still be at the Humber Mouth Festival in spirit, as the excellent Pete Crowther will be reading my story out for me, and the book ‘Four on Fear’ will be signed by me and available to all. The idea was to write a ‘fireside tale’, one of those stories to be intoned by a clubbable man telling you about a misfortune that occurred to a friend, and see if they could still raise a hackle or two. My tale ‘Uncle Alan’ hopefully does that, but one problem is that writing at a desk is not workshopping or collaborating, and I can’t ultimately tell if it will work in the way I wish. However, if you’re in the vicinity of the Hull festival, drop in and give it a go. 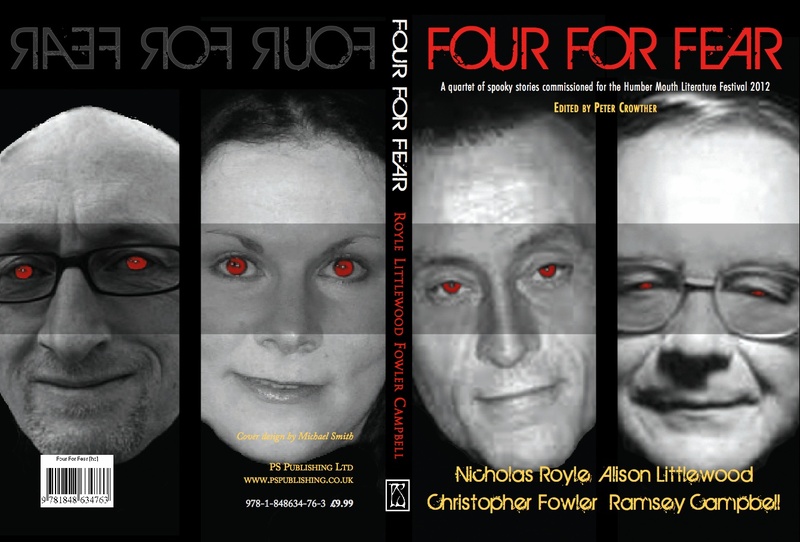 Presumably it’s Four *for* Fear since that’s the cover of the book up there. Nice you’re on the front cover but it’s the two on the back that look scarier with red eyes. Congrats on the book and what exotic place are you honoring with your presence instead of Hull? Interesting to note that you make the same joke with Hull’s name that we do, but our Hull is just across the river from our capitol so there is a whole extra range available.